Tonight's I-House presentation will be about Pakistan. Ali Shah and Farina Imamat will be among the presenters. There will be food and dancing. All of the students from Pakistan are looking forward to telling you about their country and having you try some delicious food. Be upstairs in Ridgway University Center TONIGHT at 7:00 p.m. to experience I-House Pakistan! Looking for a way to get involved on campus and the community? Hate cancer and want to make a difference? Join us on today in Koch 133 in the Koch Center for Engineering and Science at 6:30 p.m. to learn all about Relay for Life and how to get involved! Azzip Pizza gift cards will be given to two lucky attendees! Newman Club Dinner and Discussion - now on Wednesdays! The Newman Club’s first Dinner and Discussion of the semester will be today at 5:00 p.m. All are welcome to join us for a delicious home-cooked meal and a discussion led by guest speaker Kimberly Baker, alongside the students who attended the Women of the Church conference. You can find us at the house with the purple banner on Lincoln Avenue. For more information, please contact Olivia Voegerl at ov4@evansville.edu. The Changemaker Challenge is hosting its second training session on today, January 18, from 5:00-7:00 p.m. in Room 251, Eykamp Hall, Ridgway University Center. Yasser Alhenawi, associate professor of finance, and Jill Griffin, executive director of the Institute for Global Enterprise, will advise students on project budgeting and sustainability. ALL students welcome! More information can be found on the Changemaker Challenge webpage. Want to earn higher grades with lower stress? Attend one of our workshops where you will learn strategies to help you better manage your time; study more effectively; and improve reading, note-taking, and in-class listening skills. Hope to see you there. The workshops are planned for 4:00 p.m. in the Writing Center in Clifford Memorial Library today - Wednesday, January 18 - and tomorrow - Thursday, January 19. Curious about the resident assistant position? Information sessions are being held regarding the resident assistant position for any students who are interested in applying for the 2017-18 school year. Sessions will be held in Eykamp Hall, Room 253, Ridgway University Center, today from 7:30-8:30 p.m., and Thursday, January 19, from 5:00-6:00 p.m. Residence life staff encourages you to attend if you are curious about what the position entails and how you can get involved! Richard W. Maass, assistant professor of political science, will discuss the foreign policy of the incoming Trump administration on 44News with Tommy Mason on Thursday, January 19, during a segment between 8:00 and 8:30 a.m. Tune in to join the conversation! Join Venturing Crew for its annual winter campout on January 28-29! This will be a great weekend at Garden of the Gods. The group will hike and have the usual campfire, and, of course, have amazing food. Plan to leave Saturday morning at 9:30 a.m. and return on Sunday around 1:00 p.m. Since the group will be sleeping in tents, please keep in mind the weather and dress warmly. The cost of this trip is $20. The deadline to sign up for this trip is next Thursday, January 26, by 4:00 p.m. If you would like to sign up, bring $20 to the tables in Ridgway University Center lobby from 11:00 a.m.-2:00 p.m., or 5:00-7:00 p.m. on Tuesday, January 24, or Wednesday, January 25. Space is limited on this trip, so be sure to sign up as soon as possible! You must be a member to attend this trip. If you are not joined Venturing Crew and would like to join, please contact Michael Mannchen at mm650@evansville.edu. The first PT Club meeting of the semester will be Tuesday, January 24, at noon in Room 100 in Graves Hall. Please bring your $5 semester dues to the meeting if you have not already paid. If you cannot make the meeting and want to join PT Club, contact Trevor Schrock at ts158@evansville.edu or Paige Durphey at pd62@evansville.edu. Join us at Neu Chapel this Sunday at 11:00 a.m. for the university Worship service. This week we'll begin a series on the Sermon on the Mount. Uber will host one-on-one office hours from noon-4:00 p.m., today, in the Harlaxton Room in the Schroeder School of Business Building for potential drivers to ask questions. Also today, a presentation will be hosted from 5:30-6:30 p.m. in Harkness Hall in the Schroeder School of Business Building. That presentation will be open to the public. Additional information may be found on the Growth Alliance website. Please contact Kari Hughes, kh355@evansville.edu, with any questions. Prizes will be awarded including gift cards to area restaurants, Blue Tooth speakers, Blue Tooth headsets, universal portable keyboard, portable chargers, fitness/sleep monitors, and more. Sarah Lee Bivin's retirement reception is this aftermoon! Sarah Lee Bivin will be retiring after 18 plus years of dedicated service to the University of Evansville in the advancement services department. A reception will be held in her honor TODAY from 3:00-5:00 p.m. in the Igleheart Building lobby. Please stop by and wish Sarah Lee well in her retirement! The Student Activities Board will still be doing bi-weekly movies this semester! In order to accommodate schedules and avoid the movies running too late, movies will be shown at 7:00 p.m. on Thursdays. The movies will start this week with the showing of Magnificent 7. The Student Activities Board will be sponsoring a performance by Eric O'Shea in Café Court at 9:00 p.m., tonight. Eric was awarded Best College Comedian in 2007 and was the creator of the Youtube sensation Songs for Commercials. This event is free to students, and drinks and popcorn will be available. A total of 130 employers are expected at Collegiate Career Expo - Indianapolis on Thursday, February 23. This free event is scheduled for 10:00 a.m.-3:00 p.m. (Eastern Time) at the Downtown Indianapolis Marriott. The University of Evansville will provide bus transportation. There is a $10 deposit required that will be refundable upon attendance. Reserve your seat now by filling out the bus reservation form on the career center’s current students and alumni webpage. Fair registration is through UE JobLink. Click the Jobs Tab > CSM Jobs > Posting #722253. You can find a list of registered employers on the College Career Center Consortium website. There is still time to sing in the UE choirs. Singing not only feels good but is good for you. Studies show that singing is healthful, energizing and relieves stress. Sing with us and see your attitude and studies improve! To get more information on how to take part in the UE choirs, e-mail wm90@evansville.edu. Registration for the Engineering Career Forum sponsored by the Society of Women Engineers is now open! The event is on Wednesday, January 25, from 6:15-8:30 p.m. in Eykamp Hall, Ridgway University Center. The event features job search strategy sessions, and a networking reception. Registration closes on Friday, January 20. E-mail ec132@evansville.edu with any questions. Nominations for the second annual Eykamp Prize are due by 5:00 p.m. on Wednesday, March 15.Nominations can be submitted to Michael Austin, executive vice president for academic affairs, in writing or by e-mail at ma352@evansville.edu. The Eykamp Prize was established by Richard and Rita Eykamp in 2015 to honor faculty achievement at the University of Evansville. Recipients of the prize will receive an award of $10,000 in recognition of extraordinary contributions to the University of Evansville as University Citizens. Examples of such contributions include deep and successful involvement in recruiting students; expanding the number, scope, and competitiveness of grant funding for their department; and bringing positive public awareness to the University through scholarship, knowledge, and understanding of their discipline. Up to two prizes a year may be awarded. Nominations for the award may come from any member of the University of Evansville Community. Nominees should be tenured or tenure-track faculty members at the University of Evansville who have not received the award in the previous five years. Nominations should include the name of the faculty member and a brief statement of the reasons that he or she are being nominated. Recipients of the Eykamp Award will be selected by an awards committee, appointed by the EVPAA, which includes members of the faculty and staff, academic administrators, and at least one member of the Board of Trustees. Awards will be announced and presented at the May Commencement ceremony. The University of Evansville will launch a new logistics and supply chain management (LSCM) program in Fall 2018. There is a 6:1 demand-to-supply ratio for new college graduates in the supply chain field. The Schroeder School of Business will also create the center for logistics and supply chain management which will house experiential student programs and connect LSCM students to corporations. With a low student-to-faculty ratio of 12-to-1, students will also benefit from close mentorship from Schroeder School of Business faculty members. Students will also attend a speaker series where they can learn from individuals with experience in logistics and supply chain management. In October 2016, a UE student team took third place among 18 Indiana colleges in the Conexus Logistics Case Competition. These colleges, some with established LSCM programs, vied to develop the best solution to a logistics-related issue at this contest. UE’s Schroeder Family School of Business Administration maintains accreditation with the Association to Advance Collegiate Schools of Business International. (AACSB). The Schroeder School will be the first private AACSB accredited program in Indiana to offer an undergraduate major in logistics and supply chain management. To learn more about logistics and supply chain management at the University of Evansville, please contact the office of admission at 812-488-2468 or visit UE’s website. Study world history at Harlaxton this summer! It's not too late to sign up to study world history at Harlaxton this summer. Professor of history James MacLeod, who spent five years at Harlaxton, will be teaching History 112, World History from 1500, during the Harlaxton Summer Session. His course will include field trips to explore the wonders of such places as Lincoln, Cambridge, and London. The course fulfills two of the requirements of the Enduring Foundations Gen Ed program - Outcome 3 and Overlay A. This is a fascinating time in British and European history, so take advantage of this opportunity to study history in a place where history is being made. The deadline for applications is January 25, and the course runs from May 13 to June 1. The University of Evansville's Office of Religious Life has been awarded a United Methodist Interfaith Innovation Grant, made possible by generous funding from The Methodist Foundation serving Texas and New Mexico and Interfaith Youth Core in Chicago, Illinois. Grant funds will support plans for faculty and staff development through interfaith reading groups and technology to energize student interfaith leadership. "We received a higher than anticipated number of proposals for these grants, and were impressed by their overall quality and creativity. We believe these efforts hold much promise for strengthening a campus wide commitment to interfaith engagement," said Joe Morrow of Interfaith Youth Core. The University of Evansville, in pursuit of excellence in service, wishes to recognize a non-faculty employee displaying records of achievement as a leader. Leadership may be demonstrated in any of the following areas: service to the University, service to students, job performance, and attitude towards fellow employees. To be eligible, an employee must be a full-time member of administration or staff. Nominations for the February 2017 Employee of the Month are due no later than Wednesday, January 18. To nominate someone, go to AceLink and click on Areas, and then select Human Resources. The nomination form can be found under Forms on that page. A capella auditions for Ladies in Pink are planned for Sunday, January 22 at 1:00 p.m. in Eykamp Hall, Room 251, Ridgway University Center. Please prepare one minute of a pop song. Come show us your skills! All genders welcome. A reception to honor all faculty scholars will be held on Friday, January 20, at Fridays in the Melvin Peterson Gallery from 4:30- 7:00 p.m. Please stop by to peruse the depth and breadth of our colleagues’ contributions to their fields. Apply to be an International Orientation Leader for the 2017-2018 school year! 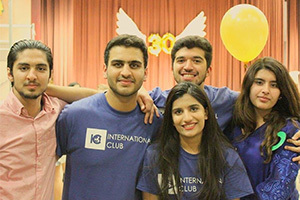 The IOLs are a dynamic group of students who work to welcome new international students to UE in August and throughout the year. Develop your leadership skills, share your UE experiences, and meet new UE students from all over the world. We welcome both international students and students from the United States to apply. Please visit the Office of Cultural Engagement and International Services in the Student Life Center on the second floor of Ridgway University Center in the Student Life Center for more information, and direct any questions to ms331@evansville.edu. Orientation leader (OL) applications are now available! To complete an electronic application before the deadline of January 23, visit the Welcome Week website. Information on “What it takes to be an Orientation Leader” and the “OL Code of Conduct” can be found on the Welcome Week website along with the application and reference forms. Current orientation leaders will be available in the Ridgway University Center from January 18-20 if you have any questions. You can also contact the Office of the Vice President of Student Affairs/Dean of Students at 812-488-2500 or stop by Room 230 in Ridgway University Center during business hours. The United Methodist Higher Education Foundation is now accepting scholarship applications. The application deadline is March 1. You can find out more about the scholarship at the foundation’s website. The UE libraries, in cooperation with the Office of the Executive Vice President for Academic Affairs, is happy to announce that the Chronicle of Higher Education is now available online to all students, staff, and faculty. Access is available by going to Chronicle.com. Off-campus access requires you to create an account using your UE e-mail address. Conduct searches, search archives and current news, and sign up for newsletters. Questions can be directed to Danielle at dw56@evansville.edu. College Mentors for Kids - become a mentor! College Mentors for Kids has been a campus organization for the past 10 years. It allows college students to give back to the community and mentor an elementary student. Activities are held on campus every Wednesday to teach elementary students about higher education, cultural diversity, and community service. If you are interested, apply online on the College Mentors for Kids application webpage. The application due date is January 24 and our first activity is January 25. If you have any questions, please contact the organization's president, Myka Goode, at mg222@evansville.edu. Welcome back to campus and classes during an Evansville winter where you can experience snow and freezing conditions on one day with rain and sloppy conditions several hours later. Meanwhile, the sun chooses to make appearances just to show us it can if it wants to. Given such conditions, it is important to be smart and pay attention to the walking surfaces you are utilizing whether it be inside or outside, on a relatively flat surface or on a ramp or staircase. Residue from pedestrian feet inside a building can make walking surfaces and stair steps slippery. 1) Be attentive to the surface conditions. 3) Ensure stairways and ramps are well lit when in use and unobstructed at all times. 4) If indoors, ensure stairways and ramps are kept dry. 5) Report unsafe conditions to Facilities (812-488-2775) and/or Risk Management (812-488-2011). Interested in traveling to South Korea this summer? The Hansung International Summer Program is led by UE professor Young Kim, and consists of intensive classroom lectures and various cultural activities and field trips in South Korea. Classroom lectures cover Korean politics, economics, arts, costume, and language. This is a three credit course that transfers to UE as PSCI 390. The deadline to submit an application for Harlaxton Summer 2017 or Harlaxton Fall 2017 is next week on Wednesday, January 25. You will need to create an online application and pay your deposit to guarantee your space on the program by this deadline. The application only takes a few minutes to complete and can be filled in online on the study abroad webpage. If you have any questions about studying at Harlaxton please e-mail ls283@evansville.edu for more information or visit the education abroad office on the second floor of the Schroeder School of Business Building. The Office of Administrative Services is pleased to announce new cost saving Enterprise holdings (Enterprise Rent-a-Car and National Car Rental) rental rates effective January 15. In addition to car rental savings, discounted commercial truck rental rates have been added. The rental process stays the same and the new rates will be loaded onto the UE account number automatically. To check out the new rental rates visit the AceLink Travel website. The School of Education at the University of Evansville has been granted seven year accreditation by the Council for the Accreditation of Education Preparation (CAEP) with the next site visit in Spring 2023. After an intense period of self-study which began in 2013, UE hosted a site visit with a CAEP review team in April of 2016. The site visit team reviewed extensive reports and interviewed members of the School of Education team to evaluate and verify the institution’s ongoing ability to meet the council’s standards for accreditation. “The accrediting team noted that we had strong, sincere relationships with our school partners,” said Sharon Gieselmann, chair of the School of Education at UE. “We are fortunate to have excellent school partners who mentor UE students during school placements beginning their freshman year. This experience allows students to apply what they are learning in university course work in a real world classroom setting. This partnership helps us provide quality candidates who are prepared to teach in K-12 schools." CAEP’s mission is to advance excellent educator preparation through evidence-based accreditation that assures quality and supports continuous improvement to strengthen P-12 learning. The School of Education at the University of Evansville has been preparing quality teachers for over 160 years with a challenging curriculum in a supportive environment. UE students thrive in small classes with dedicated faculty advisors. 100 percent of the 2015-16 class is working in the field of education or enrolled in graduate school. Rarely has the cliché “mixed emotions” been more apt for describing the feeling of saying farewell and good luck to everyone’s favorite Harlaxton transport coordinator, Zyggy Dekanski. After 16 years at the wheel, and some time spent behind reception on security, Zyggy has decided to turn over his keys. He will indeed be missed massively by his many adoring fans from around the globe. If you wish to join us in congratulating Zyggy, you may leave a comment on the Harlaxton Facebook page or send him a personal note care of Harlaxton. (We’ll make sure the cards and letters all reach him). Congratulations and thank you, Zyggy! Wichita State outscored the University of Evansville Men's Basketball team by a 52-32 tally in the second half as they earned an 82-65 win over the Purple Aces on Tuesday night at the Ford Center. Pacing UE (10-10, 1-6 MVC) once again was Jaylon Brown. He totaled 28 points on 9-of-14 shooting. Ryan Taylor registered 17 points while knocking down four triples. Dru Smith contributed in several facets, posting a career-best 9 rebounds and 7 assists. "We did a lot of good things for most of the game, but had a few breakdowns in the final minutes," Aces head coach Marty Simmons said. "Overall, I thought we competed pretty hard and can take a lot of positives away from tonight's game." Wichita State (16-4, 6-1 MVC) was led by Shaquille Morris, who notched 17 points and 10 rebounds. He was one of five Shockers players to finish in double figures. Evansville led by as many as 13 points in a dominant first half as they went to the half leading 33-30. The Aces opened the game hitting their first four shots on their way to an 8-6 lead. Shaquille Morris scored the first eight for the Shockers as they tied it up at 8-8 before a Conner Frankamp trey gave WSU their first lead at 11-10 five minutes in. With the score tied at 13-13, UE went on an 11-2 stretch that saw them open up a 24-15 advantage with four different players scoring in the run. Landry Shamet ended the stretch as an and-one made it a 24-18 game. Ryan Taylor helped UE open its largest lead of the game as back-to-back triples helped the Aces open up their largest lead of the night at 30-19 with just over five minutes remaining. The Shockers refused to give up as their defense clamped down, holding UE to one point in the final minutes while treys from Shamet and Austin Reaves got WSU within three at 33-30 going into halftime. Three triples in the opening minutes of the second half saw the Shockers complete an 18-3 run as they took their biggest lead to that point at 39-35. Sergej Vucetic ended the run before a Jaylon Brown three put UE back on top at 40-39. Ryan Taylor added four points to complete a 9-0 run that gave the Aces a 44-39 lead. Frankamp hit consecutive treys as WSU went back on top at 48-46. After the Shockers pushed the lead to 53-48, Taylor ended the stretch with an and-one, but Frankamp struck again with his fourth trey to make it a 58-51 game and it was all Shockers from there as they extended their edge to the final of 82-65. A strong second half saw WSU finish with a 33-31rebounding edge and a 50.9%-44.2% shooting lead. The Shockers went 18-of-27 (66.7%) in the second frame. Trips to Chicago and Cedar Falls await the Aces over the next eight days. On Saturday, the Aces take on Loyola in a 3:00 p.m. game before going to UNI next Wednesday. University of Evansville head cross country Don Walters is busy building his new track and field program, which will be added to the University of Evansville’s Department of Athletics. Announced in October, the track and field programs will provide four new sports to UE athletics. The addition has made news on a national basis and, most recently, the NCAA took time to speak with Coach Walters about his work with athletics director Mark Spencer in his quest to make his dream become a reality. The article will be published in the NCAA’s Champion Magazine, which is published on a quarterly basis.